DOEE Watershed Protection Division implements projects that control, prevent, and provide remediation for sources of stormwater pollution to District of Columbia (District) waters and the Chesapeake Bay. One approach to managing stormwater runoff from rooftops is the low impact development technology called green roofs. What is a “Green Roof”? Green roofs are stormwater management practices that capture and store rainfall in an engineered growing media that is designed to support plant growth. A portion of the captured rainfall evaporates or is taken up by plants, which helps reduce runoff volumes, peak runoff rates, and pollutant loads on development sites. Green roofs typically contain a layered system of roofing that is designed to support plant growth and retain water for plant uptake while preventing ponding on the roof surface. The roofs are designed so that water drains vertically through the media and then horizontally along a waterproofing layer towards the outlet. Extensive green roofs are designed to have minimal maintenance requirements. Plant species are selected so that the roof does not need supplemental irrigation and requires minimal, infrequent fertilization after vegetation is initially established (citation: DOEE Stormwater Management Guidebook, Chapter 3.2). Did you know?? A green roof can double the life of your roof! There is currently more than 3 million square feet of green roof in the District! You can see DOEE’s current Green Roof Inventory. 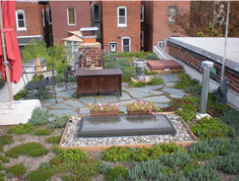 This includes green roofs that are installed to meet D.C.’s stormwater regulations as well as voluntary installations like those that are subsidized by the green roof rebate program, RiverSmart Rooftops, which you can learn about below. The District RiverSmart Rooftops Program was started in 2006 and has since greatly contributed to the installation of green roofs District-wide. DOEE seeks to promote the voluntary installation of green roofs for the purpose of reducing stormwater runoff and pollutants. As a result, DOEE offers a rebate of $10 – $15 per square foot for voluntary installations of green roofs around the District. The specific rebate amount depends on whether the proposed green roof is located within the combined sewer system ($10/sq.ft.) or the municipal storm sewer system ($15/sq.ft.). Determine in which area your parcel is located. There is no cap on the size of projects eligible for the rebate; properties of all sizes including residential, commercial and institutional are encouraged to apply. For buildings with a footprint of 2,500 square feet or less, funds are available to defray the cost of a structural assessment. Learn more about that in the Structural Engineering Rebate Application (.pdf also attached below). Project registration is the first step in the District's RiverSmart Rooftops Program application process. Please complete the RiverSmart Rooftops Program Interest Form to submit your application. Once your registration is received and approved, you will receive additional materials so you may continue the application process. You may also contact Designgreen, 202-849-0388, [email protected] for more information or to register. Registration Form - If you prefer register manually, you can download a copy of the interest form (also attached below). Please complete it and send it to: Designgreen, [email protected]. Projects will be placed in the rebate funding queue only after DOEE receives a completed Application Form with all supporting documents. Important note: Applications for recently completed or existing green roofs will not be accepted. You must start the rebate process before you have received a permit for the green roof. Voluntary green roofs are eligible for the RiverSmart Rewards program which offers discounts on your DC Water bill. In addition, green roofs installed as a part of the RiverSmart Rooftops Rebate program are also eligible to participate in DOEE’s Stormwater Retention Credit trading program. Learn more about these programs at the links provided. The following resources will be helpful in installing and maintaining your green roof. Green Roof Toolkit: two different versions. AWS has the more recent one. Structural Engineering Rebate Form *for roofs under 2,500 sq.ft. List of Green Roof Contractors in the District: DOEE does not endorse or refer companies or individuals. Their presence on this list does not represent a statement about the quality of their work or customer service. Green roofs, like all stormwater practices, require ongoing care in order to maintain their function as a stormwater practice. See DOEE Grean Roof Maintenance Tips document (.pdf also attached below) for more infomation. These reports are just a small subset of the technical reports that detail the benefits of green roofs. Monitoring of a New Green Roof for Water Quality and Quantity: A report of a green roof monitoring experiment conducted by the District in 2007. Green Roofs for Healthy Cities (GRHC) is an industry organization that sponsors annual technical meetings and trade shows --- their web site provides information about green roof technology and businesses. Greenroofs.com contains encyclopedic references to green roof industry. Greenroofplants.com is a local grower of green roof plants and provides technical and business data. Green Roof Research Center at Pennsylvania State University is a local source of green roof monitoring data.